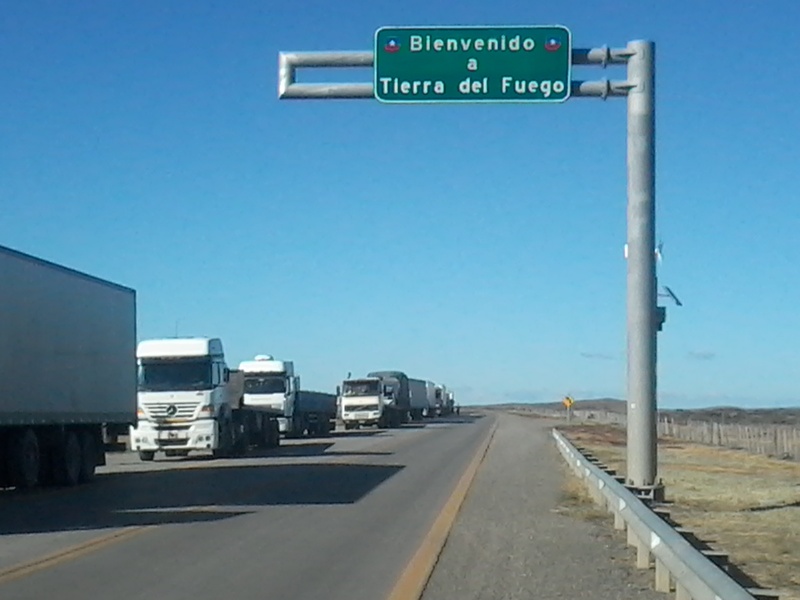 When getting off the ferry in Primavera, we have finally arrived in Tierra del Fuego and the first sight is a looong lane of trucks, having to wait here for hours before they can cross the channel. The boat is rather small and can only take a certain number of trucks at each passing. We can but feel sorry for them whilst for us, once again with wind in favour, itˋs a fast ride in the opposite direction. 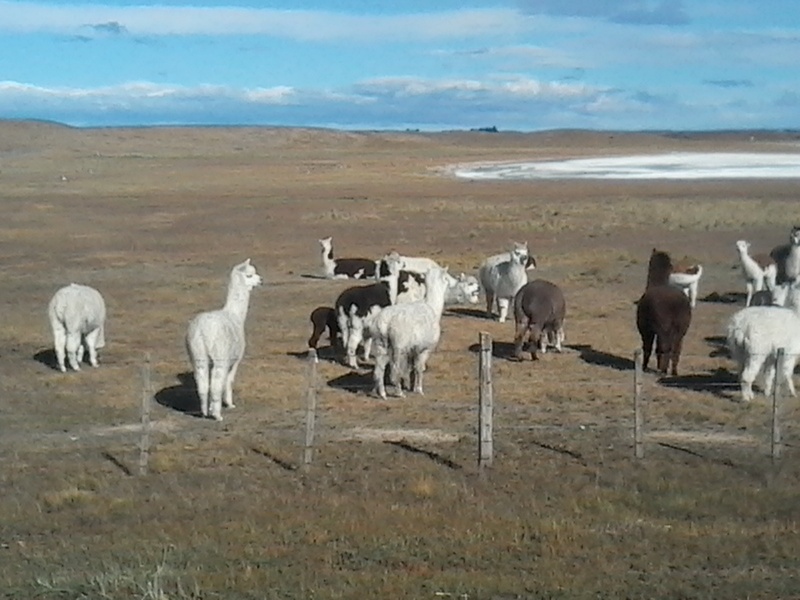 The scenery is still an endless green and yellow under a blue sky and at one point we find a reminder of the bolivean Altiplano although we are at sea-level: a group of Lamas, next to the white salty surface of a dried-out lake. 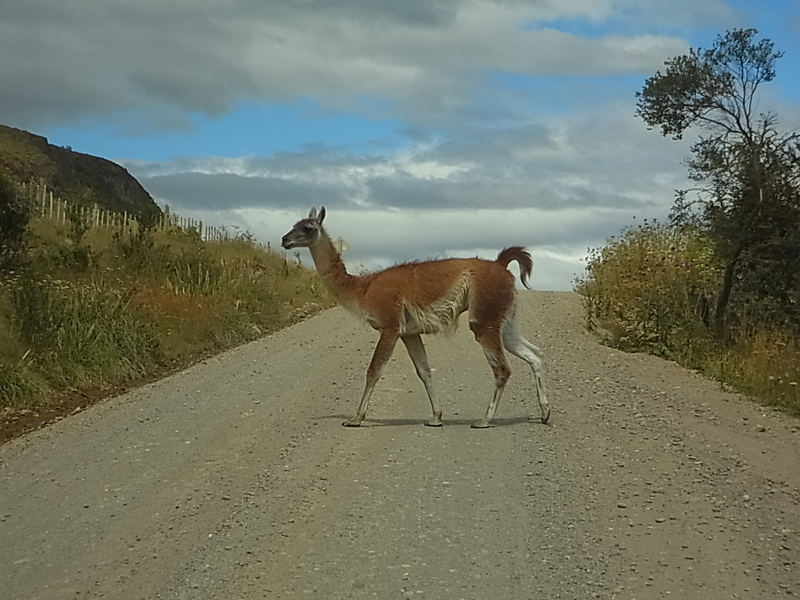 Their shy relatives, the brownish colored Guanacos are a more common view all over Patagonia and sadly enough, not always alive anymore but as victims of collisions with cars. We more or less fly the 70km to Cerro Sombrero, one of the only two bigger chilean settlements on the island, but getting out of the worn-out, sleepy Cerro Sombrero turns out to be nearly impossible. Now cycling against the wind we do 500m in 10min, at this ratio we wonˋt get anywhere and therefore decide to try hitchhiking back to the main road where we will have again side- or tailwind. 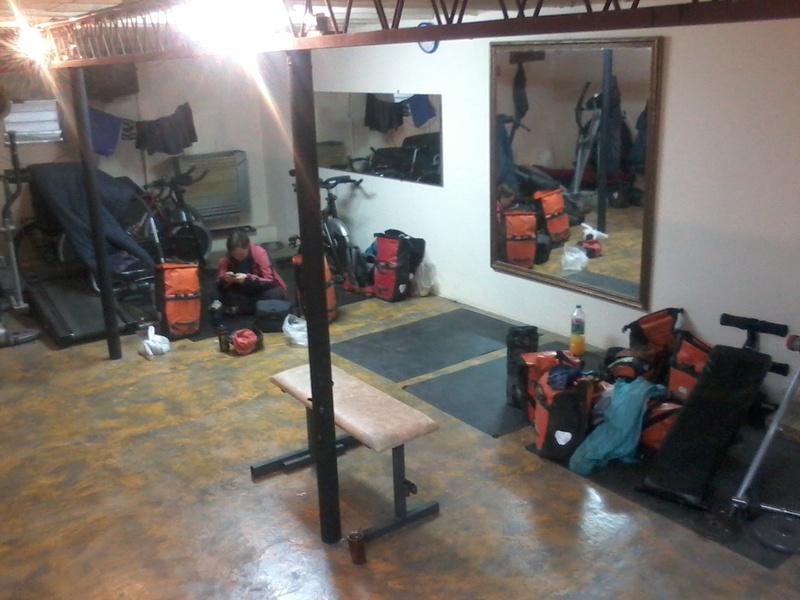 As a matter of fact we donˋt cycle much more this day, only 14km from the chilean to the argentinian migration office where we spend the night in a waiting room. 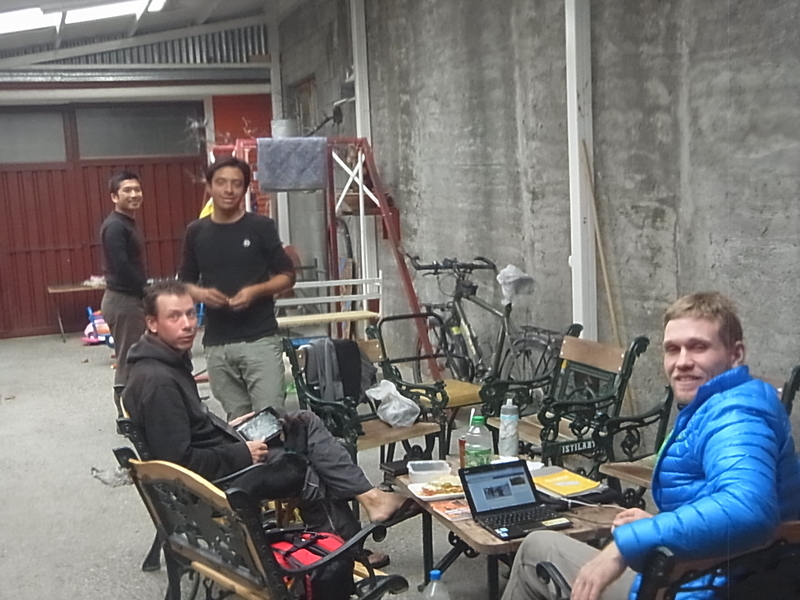 Just as we are settled in three more cyclists (whom we already met before) arrive and the five of us share the place. 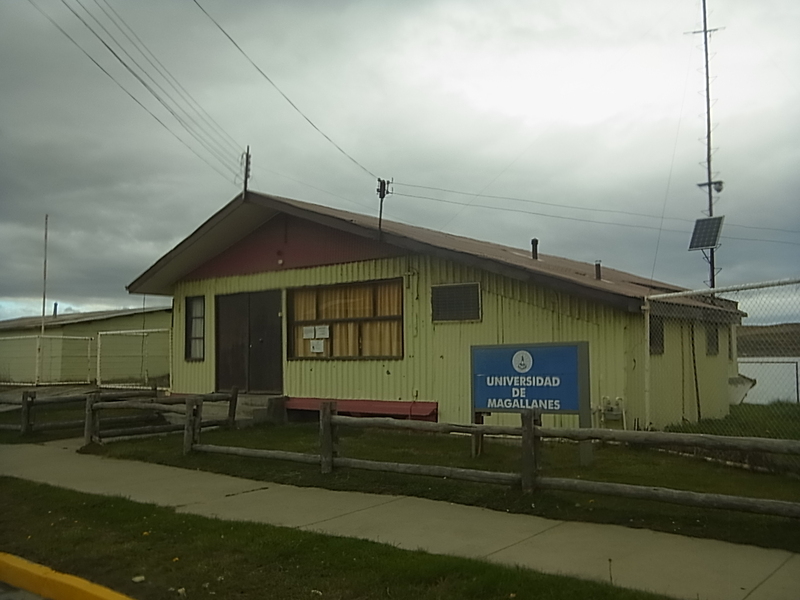 It is big enough anyway and we all enjoy the comfort of heating, running water, electricity, a gas stove for cooking and a closed room to sleep in. 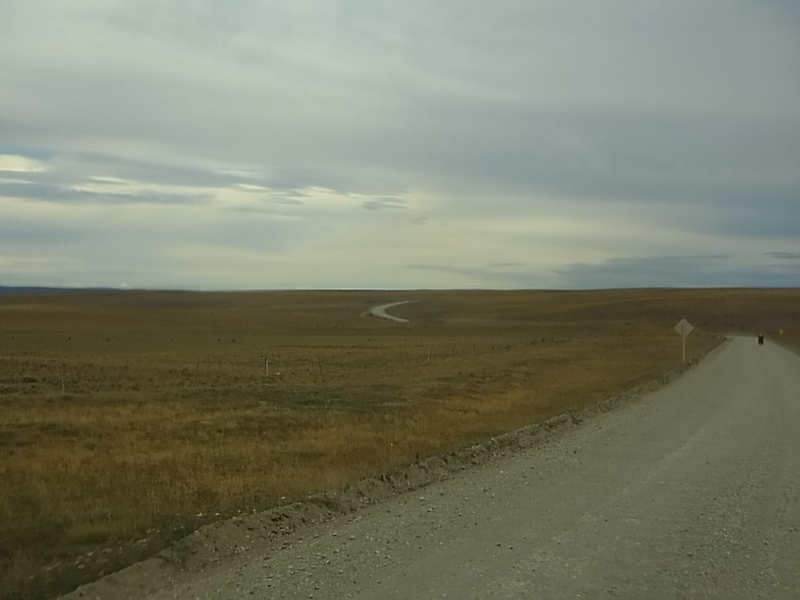 Gracias Argentina for this comfort and also for the paved roads – the argentinian part of Tierra del Fuego is much better maintained than the chilean part. 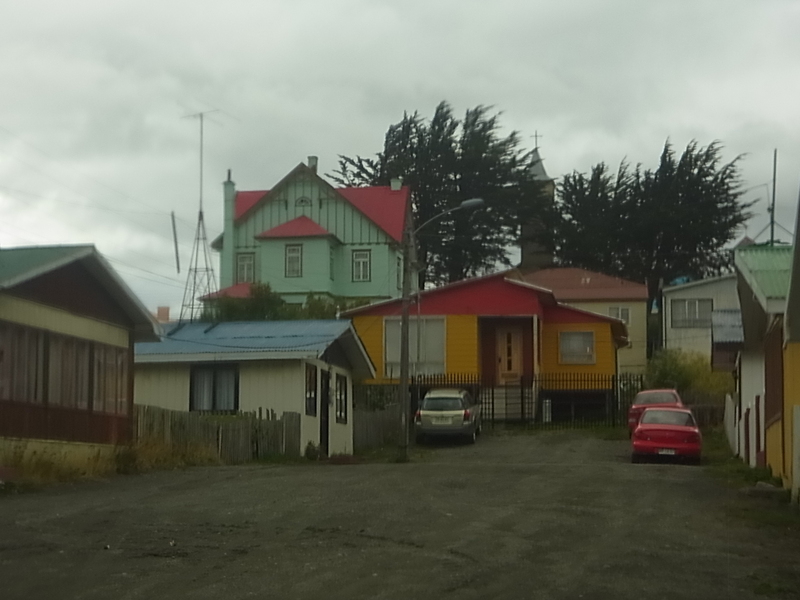 The island is divided between these two countries and this neighbourhood was never a friendly one. 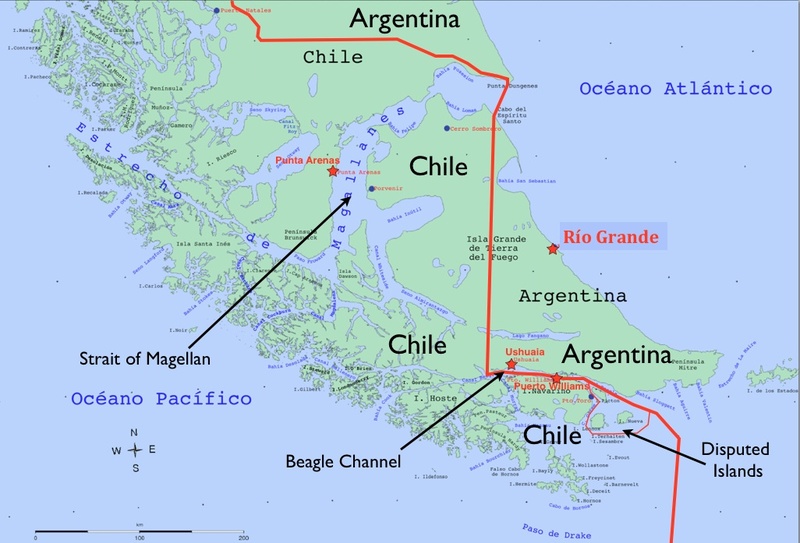 Chile supported the Brits in the Falkland-war (1982/83) and the memory of this war is still very present, the more since Argentina still claims to be the legal owner of the Falklands (signs with the slogan “Las Malvinas (Falklands) son Argentinas” are distributed all over the country and itˋs also a big theme in politics, especially close to elections). During this war, all borders on Tierra del Fuego were closed and plastered with mines, the only occasion to open them was a big annual Offroad Car- and Motocrossrace, the one and only passion which units chilean and argentinian Fueginos. Around Tolhuin the landscape changes again, close to the Andes it becomes more vegetated, and good-size plants and trees are again part of the views. The small village awaits us with a nice surprise. 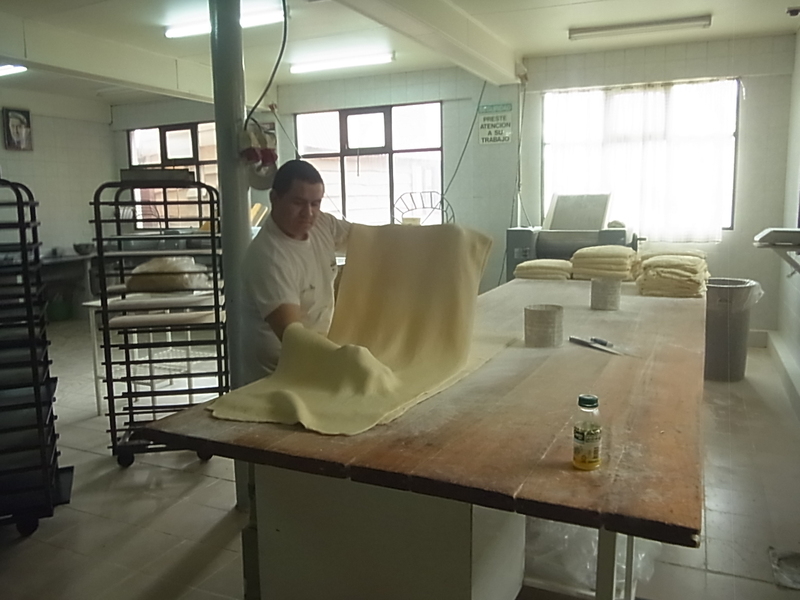 When arriving, we go in search of Panaderia ´La Union´, where the owner Emilio invites cyclists to stay in his home for free. 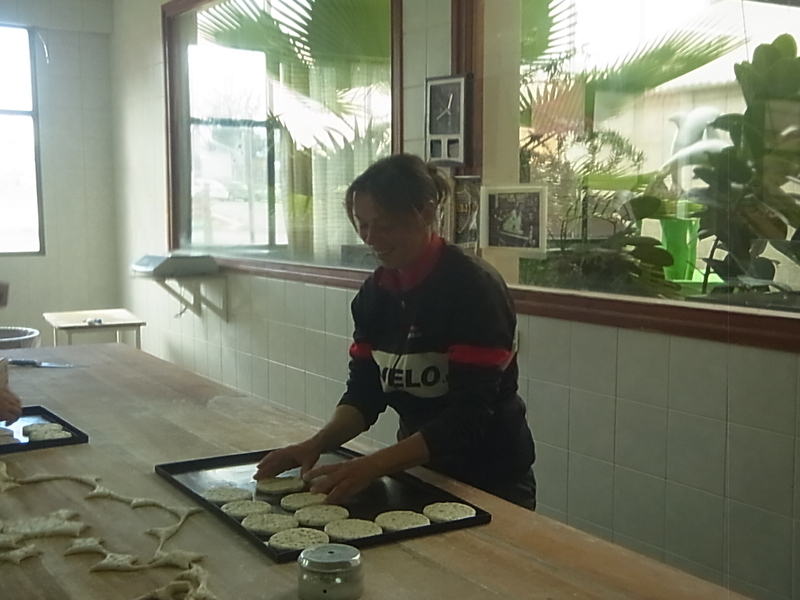 We find the Panaderia without any problem, and it´s heavenly: A big heated cellar, converted into a gym and now used as a dorm for cyclists with a big sheltered innercourt to cook, sit, chat and spend time with others. 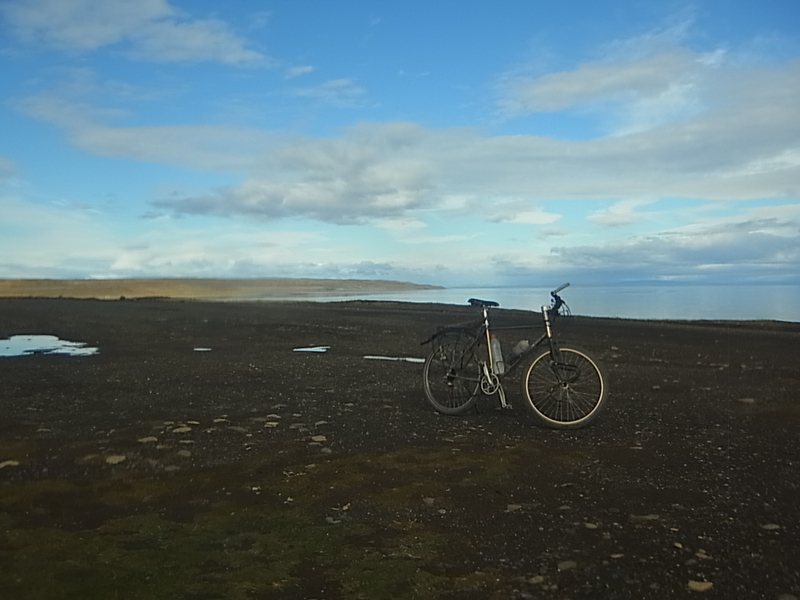 Three days later we continue cycling since we want to complete our ride to the end of the world. 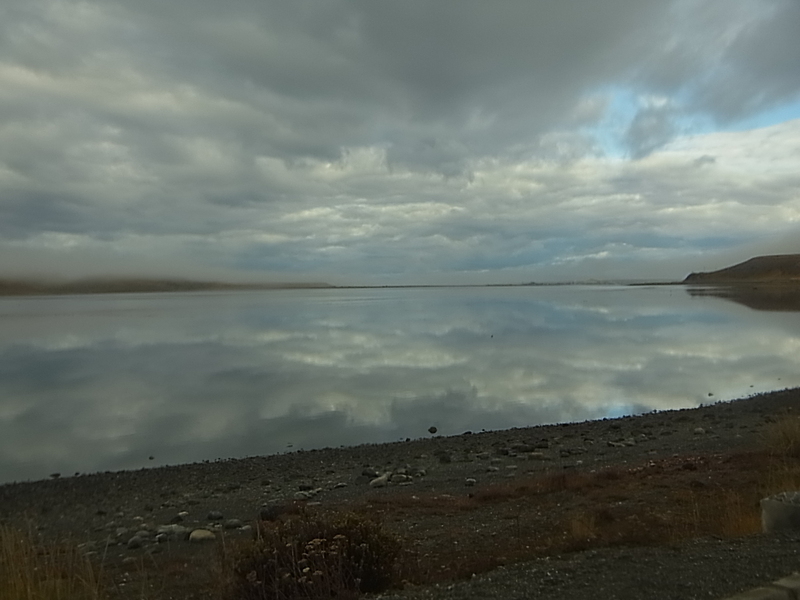 We pass through a beautiful scenery with trees, mountains, lakes and rivers – a landscape formed by ice over thousands of years. A last crossing of the Andes (which take a turn to the East here), a last night camping out (but in fact inside a big iglu made out of plastic) and a last long downhill, than we are finally there – at the entrance gate of Ushuaia. But what a disappointment, the “end of the world” turns out to be everything else than picturesque: a crowded city, surrounded by 6km of a grey industrial zone and overrun by tourists. 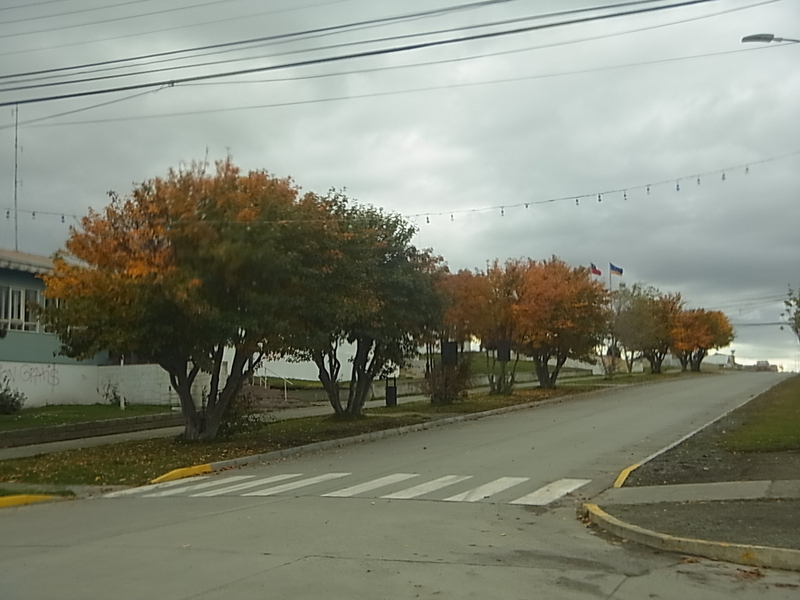 Actually Ushuaia is not the end of the world and not even the southernmost city but Argentina is doing a very good touristic marketing job and so Ushuaia is a well known and well visited city while hardly anybody visits the real southernmost village of Puerto Williams in Chile on the other side of the Beagle Channel. 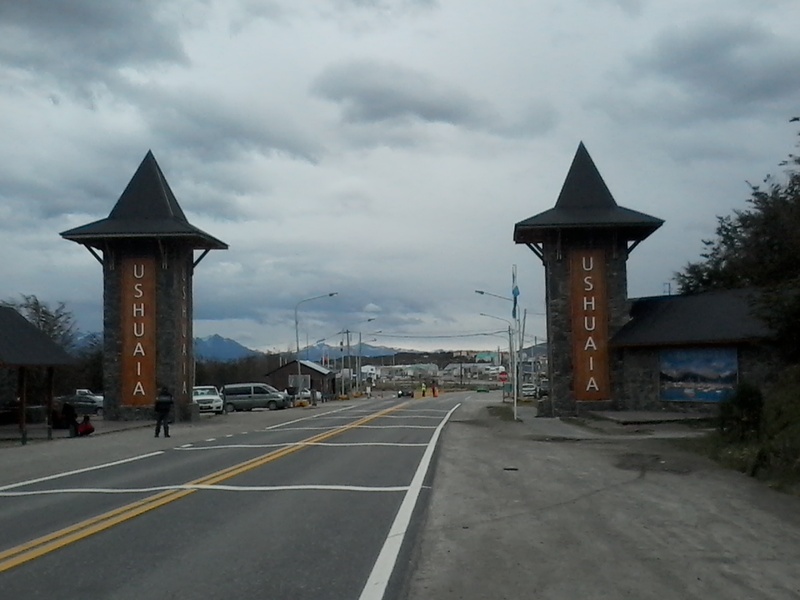 Ushuaia is not the end of the road either, for whatever reason it was built 24km further southwest out of Ushuaia and the final point is called Lapataia and consists of nothing more than a parking lot. 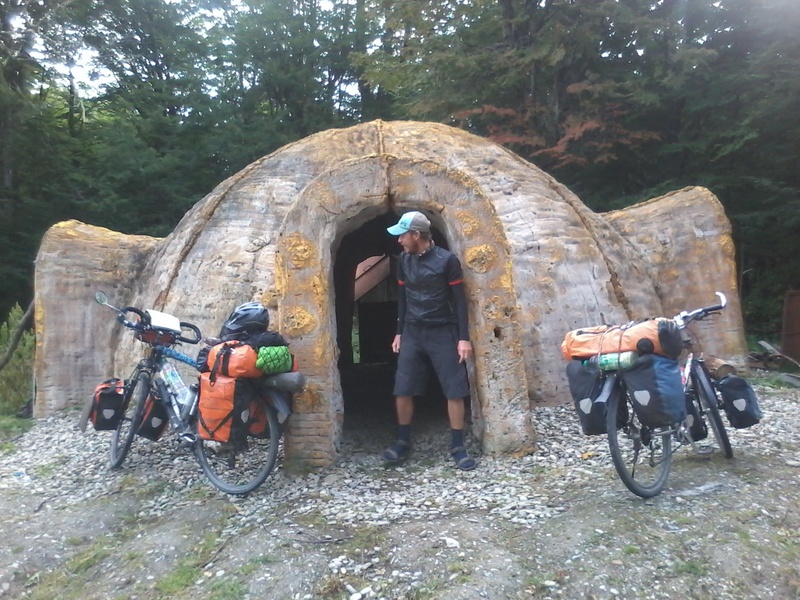 Than it is off to the cheapest lodging in town: Refugio del Mochillero, where we can camp for a very fair price in the backyard and use all the facilities inside. A good deal, the more because by now (12 of march) itˋs autumn and so far South this means cold, wind and rain or even snow. 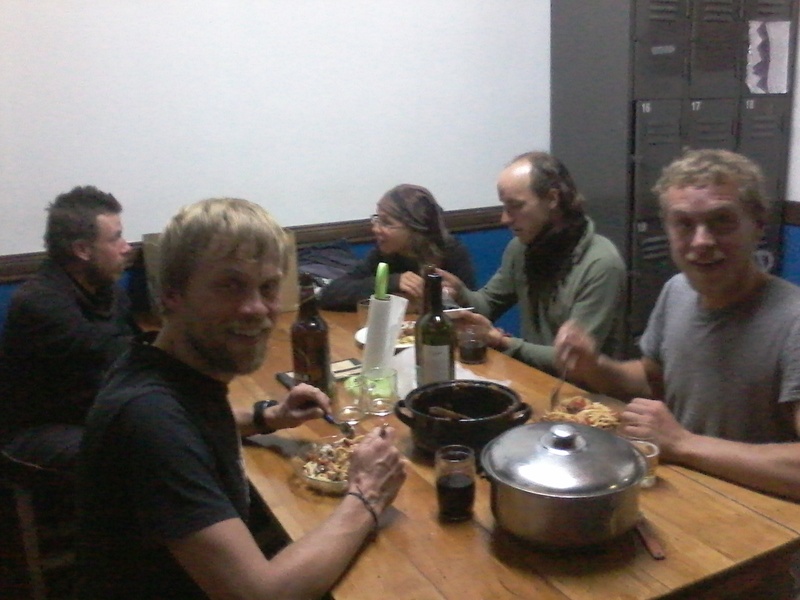 Inside the Hostel itˋs once again like a reunion of cyclists but this time we know itˋs really the last one. 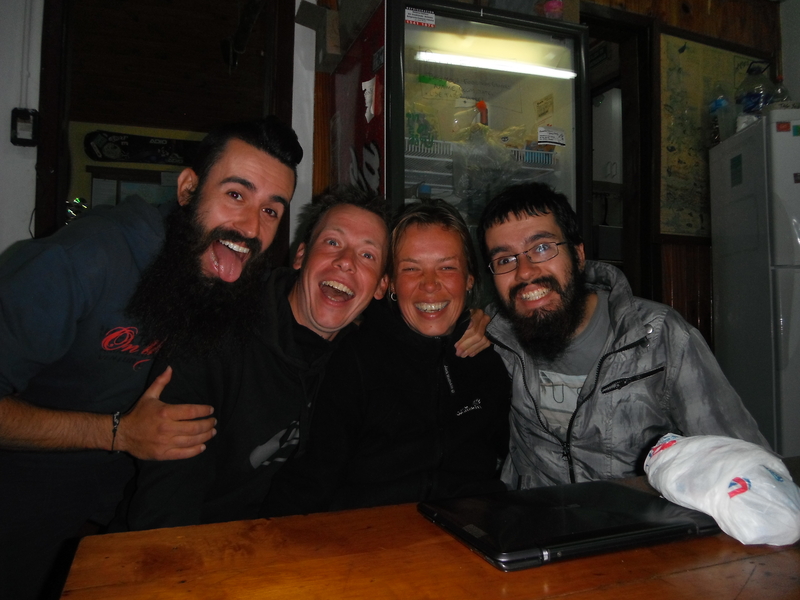 Zuzanna and Pavel from Slovakia, Marc and Carwin from Scotland, Scott and Sarah from the US, Mette and Claude from France, Sherry and Sharmian from the UK, Sebastian from Ecuador, Paul from New Zealand, our brasilian travel buddies, and, and, and… it is incredible meeting all these people here and itˋs strange and a little bit sad at the same time. 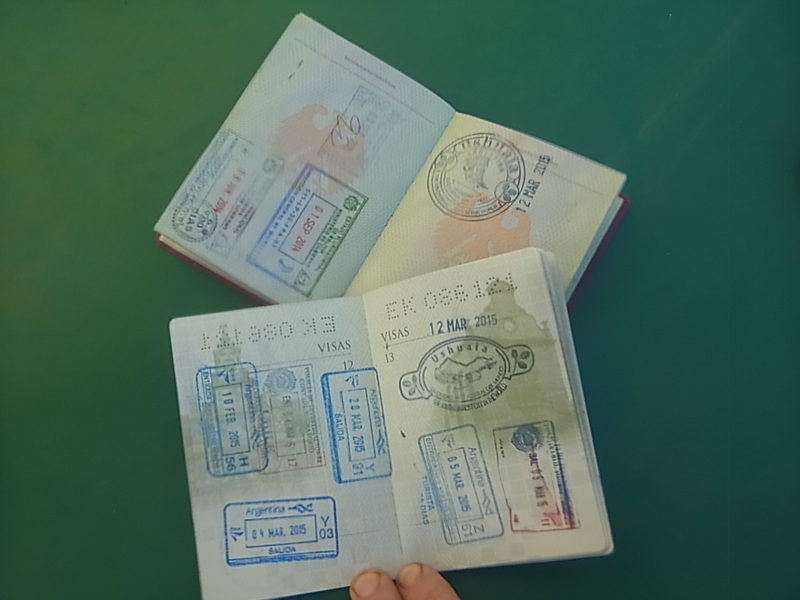 Nearly all of them will leave Ushuaia by plane in direction of their home countries while we are the only ones continuing our travel in South America. 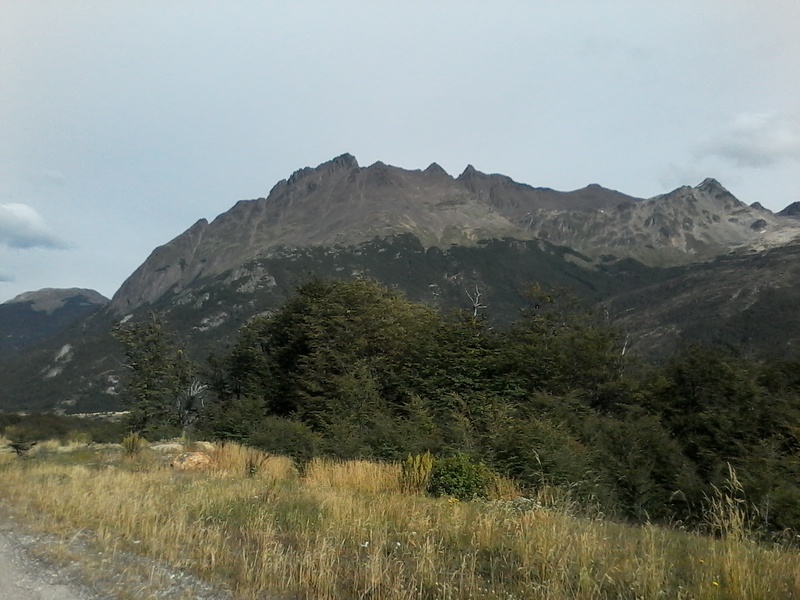 Cycling on feels a bit weird and lonely this way and on top it rains the day we leave Ushuaia. 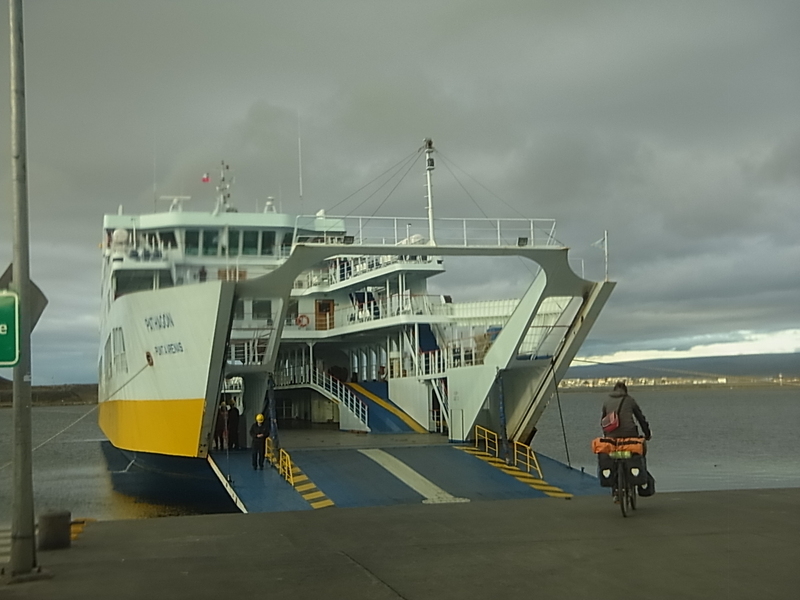 When passing the entrance/exit gates there is a queue of cars, and we decide to ask the first pick-up in line for a ride to Tolhuin, as we are already soaking wet and ice cold from riding 6km, what would it be after a 100 more? So an hour later we are in Tolhuin, back in the gym of Emilio where we will stay for nearly two weeks more. 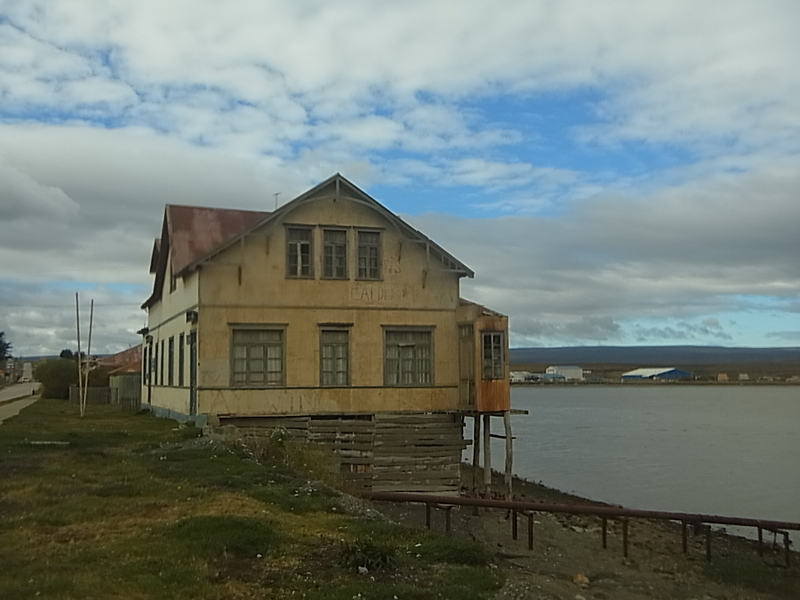 In Rio Gallegos we booked two passages for the 7th of april on the boat from Puerto Natales to Puerto Montt, a 3-day trip through the patagonian Fjords. 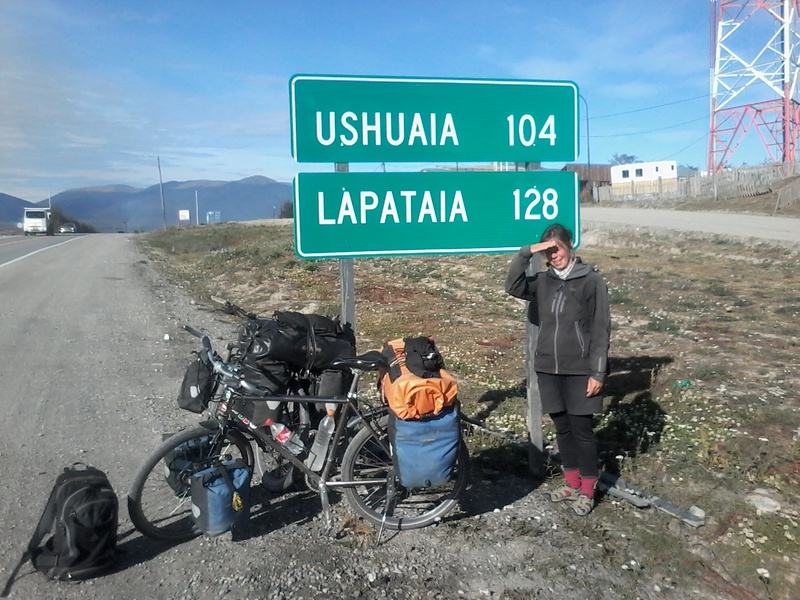 Back than we calculated with four weeks to cycle the whole stretch down to Ushuaia and back to Puerto Natales, but now itˋs only two weeks later and we are already on our way up North and have two weeks time to kill. 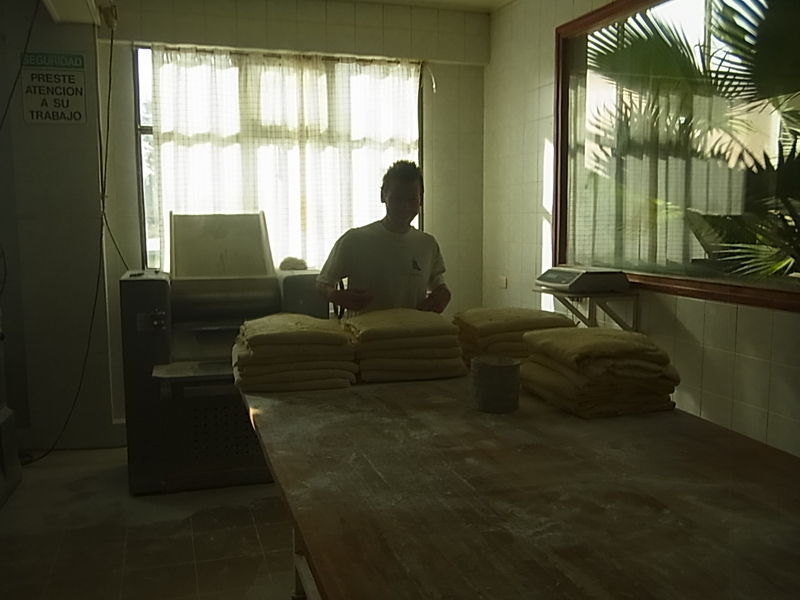 No better way to do this than with a little bit of work and so we start helping out in the bakery. There is a holiday week-end of 4 days in Argentina coming, and on top of that there is a motorcross-competition in town, and the even during normal days very well visited Panaderia is expecting some 20.000 customers. Every helping hand is welcome to prepare thousands of pastries, loads of bread, pizza, homemade chocolate and snacks in all variations from sweet to salty. 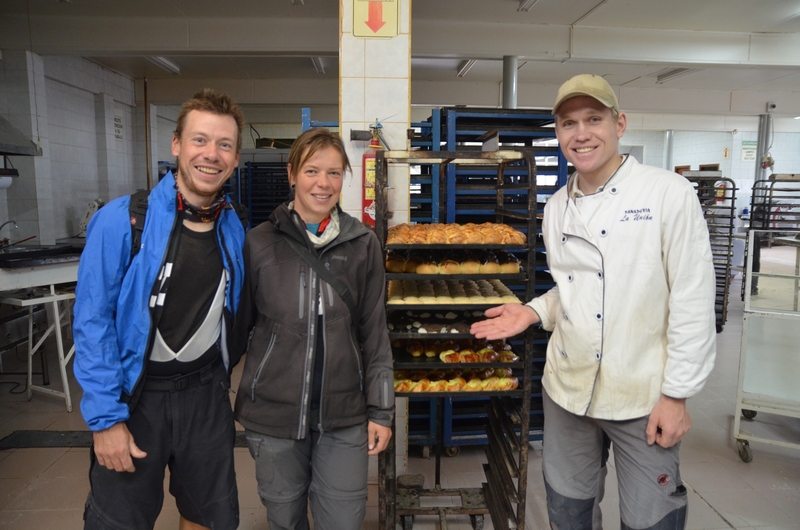 When itˋs time to leave we say good-bye to the guys at the bakery and to Sebastian and start our way back up North. 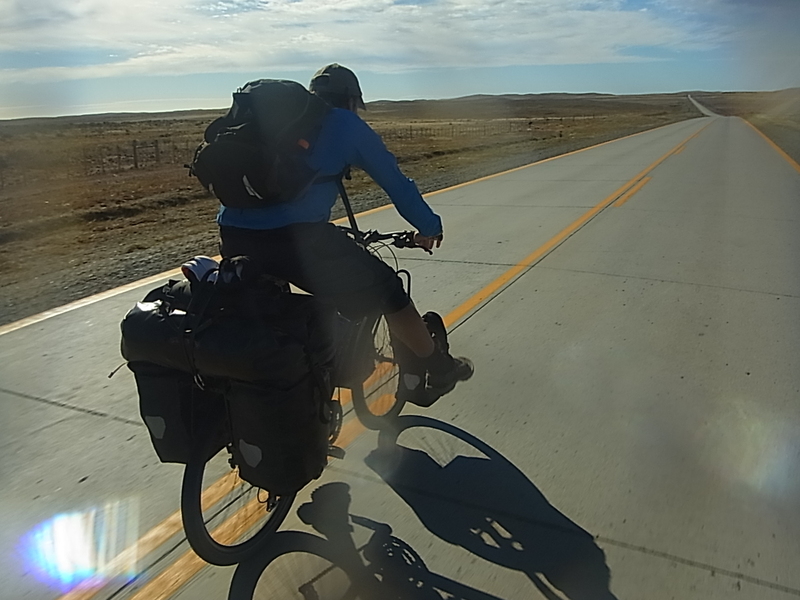 We do the whole stretch back to the border in San Sebastian and then to Porvenir in a mix of cycling and hitchhiking, first because we have cycled the bigger part of it already in the other direction and second because of the bad weather. 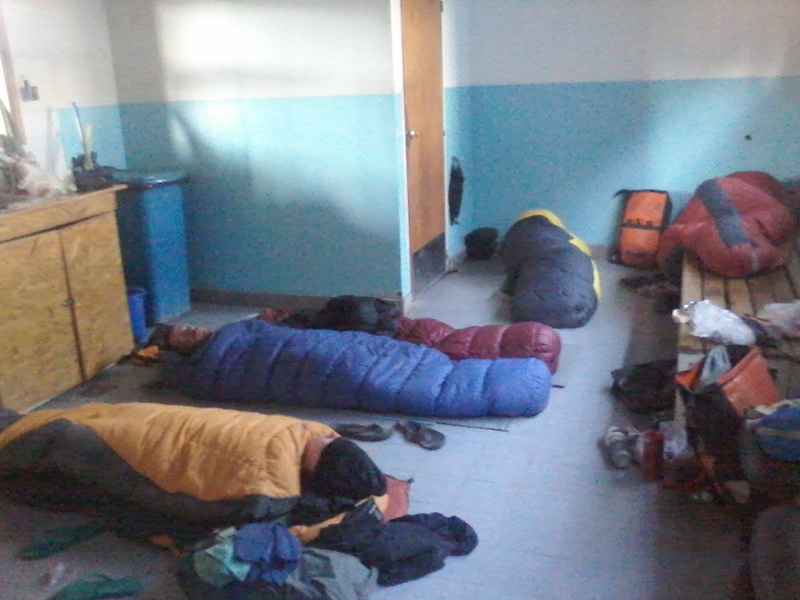 After four months of cycling our energy level has nearly reached rock bottom, we canˋt stand the cold very well and want to get as fast as possible to Punta Arenas, where weˋll try Couchsurfing for the first time and know, that a warm place is waiting for us. 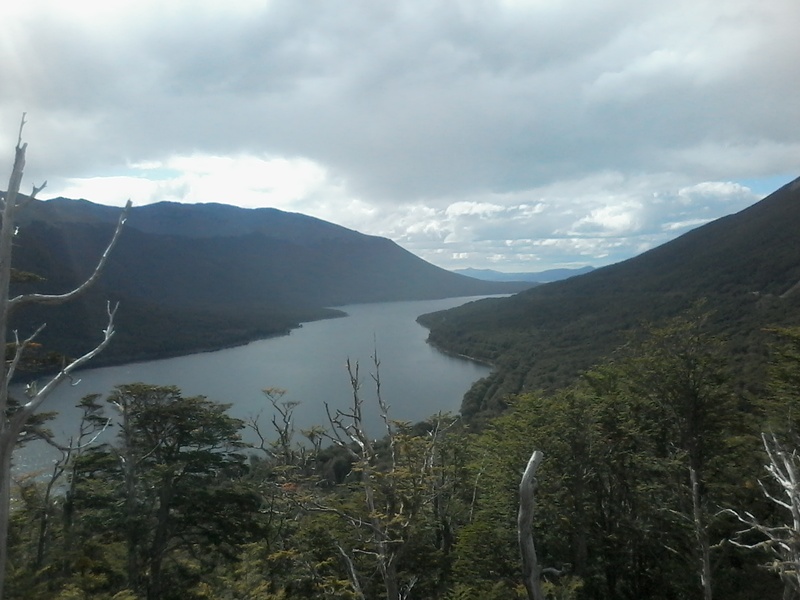 The last night on Tierra del Fuego is a little bit special. 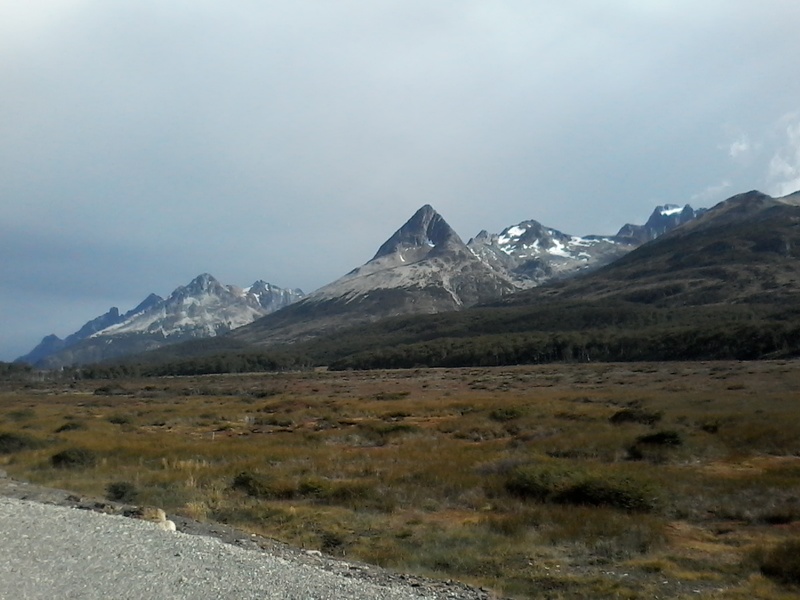 Cycling in direction of Porvenir, an argentinian couple with a van stops at our side and we get a ride with them. They drop us off at the Cabanas de los Pescadores, some cabines at the seaside where fishermen live. We get permission to put up our tent there and like always, the people are far more than friendly and helpful. 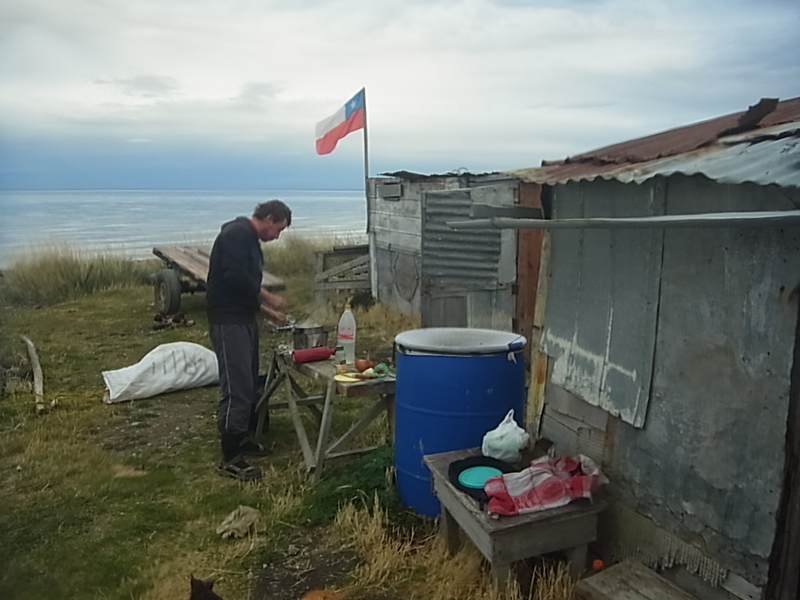 We are offered to cook and eat inside their cabin where a big fire is burning, use their drinking water and while they work their fishing lines and nets, they call us to show us whale fountains in the distance, coming from Orcas. Impressive although we can hardly see more than the fountain and a black bump in the water. 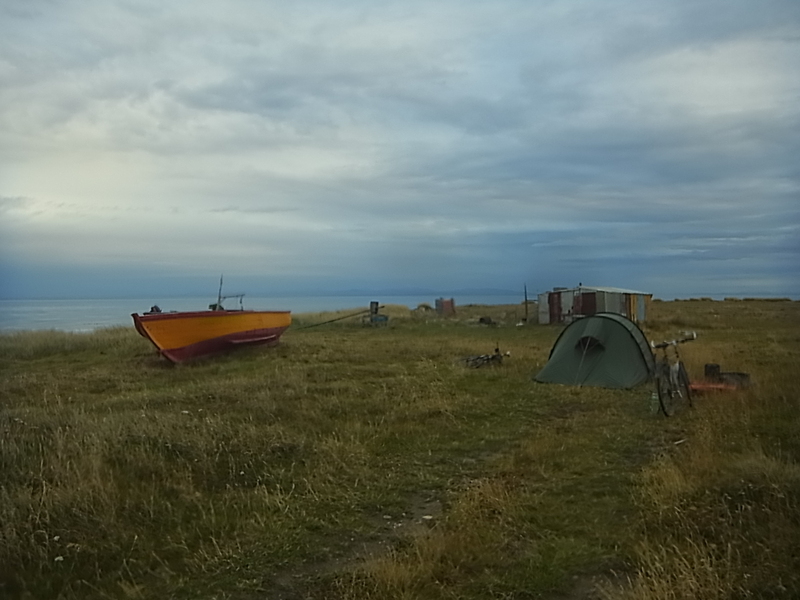 The next day starts again with wind and rain but luckily one of the fishermen has a small truck and offers us a ride for the last 40km to Porvenir, the village from where the ferry crosses the Estrecho de Magellanes to Punta Arenas. 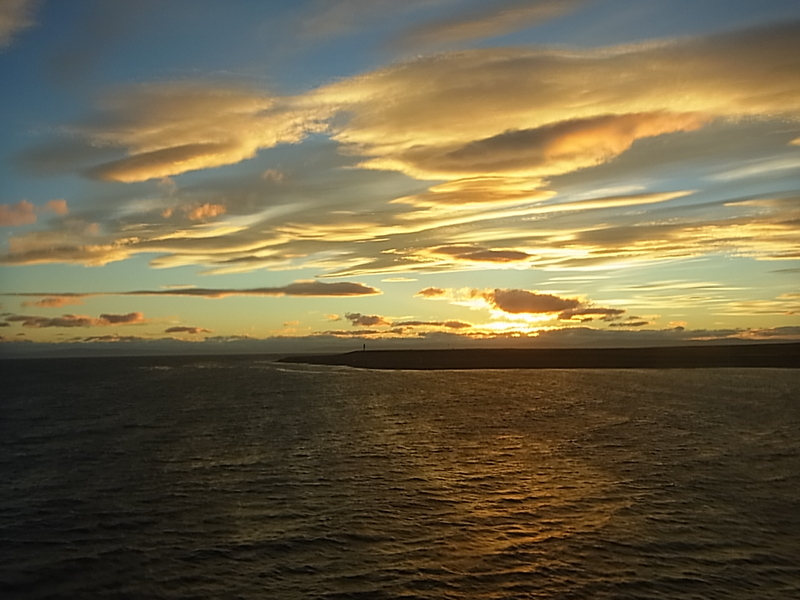 In the evening we leave the island with the last sunrays falling over the water and dolphins jumping around the ferry – good-bye Tierra del Fuego!